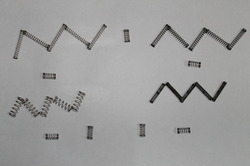 We are a leading Manufacturer & Exporter of Ball Pen Springs. Our product range also comprises of Compression Springs, Torsion Springs and Conical Spring. The excellent range of Ball Pen Springs is offered to the customers, as per their specific requirements. These springs are manufactured in compliance with the international quality standards. In addition to this, we make sure to deliver a flawless range of products at the client's end by checking it thoroughly on certain well-defined parameters, at our end.